While having a little vacation time left, I took a mini vacation this week to get somethings accomplished around the farm. I take this time off every year because it just helps to stay on track with everything. Today was spent preparing the 3 bee hives that we have for the colder weather to come. The first hive was doing so-so, it had swarmed many weeks ago so they are playing catch up, the second hive was un-believably right on track with where they should be. 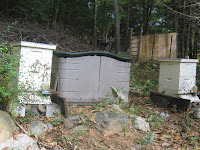 The frame on the right (pictured) is some of their honey reserves as well as some brood (baby bees) in the center. The third hive is the little hive that could. I have worked on setting this hive up since August with surplus bees from the observation hive at the Nature Center where I work. Just last week I took another 2000 bees out of it and brought them home and added it to the hive by placing a sheet of newspaper over the first hive body. 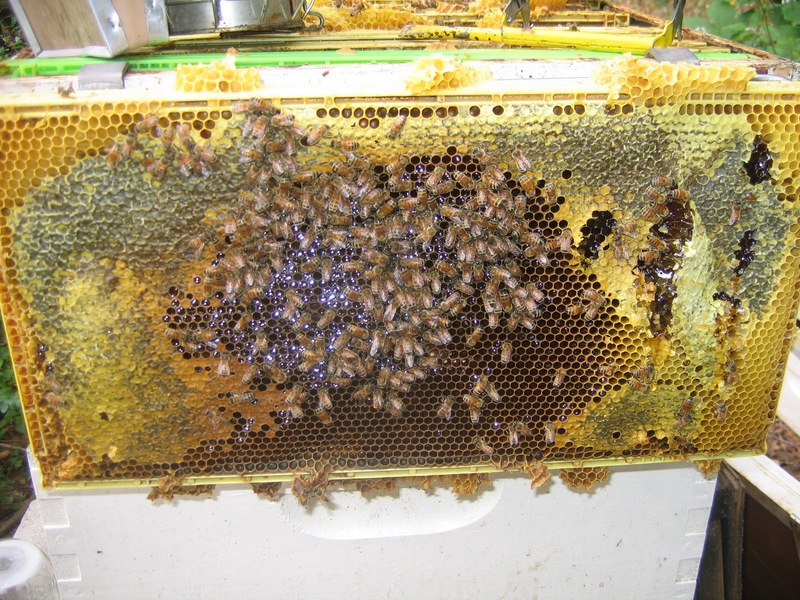 This gives them time to be captivated by the queens pheromones so they can combine with the hive and not kill her. So overall I am mostly pleased with my bees going into the colder weather. Last year I combined my hives to one strong with bad results, so I am taking my chances this year by allowing the hives to stay independent, I think the odds are better that way. 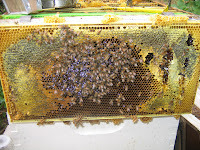 We will continue to feed them and eventually pull the outer feeders off and put the inner feeders inside the hives. I placed large rocks at the entrances under the cinder blocks as well as using old frames to block the sides of the cinder blocks. Venting a small space between the hive bodies (about a match book amount) allows for the hive to keep from building condensation up. The temperature in the hive is about 90 degrees with their body heat. So better luck next year, we had no hiney this year due to losing our hives, so next spring we should have bees ready to go and get a head start on honey!